A leader in decorative hardware design, Amerock introduces 1929 Refined, its spring collection of 33 exclusive new designs that infuse interiors with style. Debuting a total of 106 new products at KBIS, Booth S7041, in Las Vegas, January 19-21, the company proves once again its pre-eminence in offering innovative design solutions down to the last detail. Eight new collections and up-to-the minute finishes accessorize traditional, transitional, and contemporary designs. True elegance need never raise its voice. The Wells Collection’s angled edges, mimicking a gemstone cut, provide subtlety and a perfectly balanced silhouette that enhance furniture and cabinets without upstaging them. You can also mount knobs at a 45-degree angle to adorn homes with a diamond motif. Select from polished nickel, oil rubbed bronze, or satin nickel square knobs or rectangle pulls. The Crawford Collection brings together fine lines and smooth transitions to create accents with unforgettable style that never fades into the background. Subtle, tactile design cues mean Crawford knobs and pulls are perfect for pairing. Spice up your cabinets with golden champagne, oil rubbed bronze, or satin nickel round knobs or pulls. Elegant beading adds visual interest to our Carolyne Collection, making each piece exquisite. Bright and polished or strong and subdued—you'll have your pick of gorgeous and stately finishes with this selection of knobs and pulls. Mix it up by combining round and square knobs with long pulls in polished nickel, oil rubbed bronze, or satin nickel finishes. The timeless, barbed-quatrefoil shape of knobs in this collection echo a pattern found in trendy, Moroccan-inspired design, while stepped edges introduce depth and definition from every angle. Give cabinets a fresh new look with golden champagne, oil rubbed bronze, or satin nickel finish knobs that coordinate with the Revitalize pulls. Sophisticated finishes meet organic inspiration in the Sea Grass Collection. Slender lines resembling those of delicate fronds or the sun’s rays introduce textures found in nature to this line of knobs and drawer pulls. Decorative shell-like cup pulls, knobs, and long, slender bar pulls highlight cabinets with golden champagne, satin nickel, or oil rubbed bronze finish options. Cutting-edge European design infuses polished drawer pulls in the Esquire Collection with a streamlined, contemporary look. Striking tactile materials paired with lustrous finishes add texture and warmth to pared-down designs. Unique two-tone finishes include stainless steel with polished nickel, oil rubbed bronze with satin nickel, and gunmetal with polished nickel in t-knobs or long pulls. The grooved, stepped edges of Oberon pulls provide an intriguing variation on modern design. Solid cast knobs, as well as those with acrylic inserts that catch the light and provide contrast with metallic finishes, pair well with our sleek bar pulls. 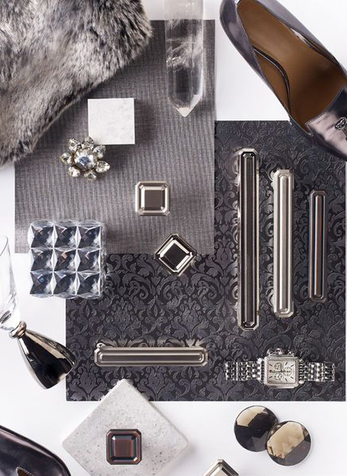 Create your own style by combining the solid gunmetal, satin nickel, and polished nickel with the mixed media gunmetal and frosted acrylic, satin nickel and frosted acrylic, or polished nickel and frosted acrylic knobs. Strong lines paired with restrained finishes give the Davenport Collection eclectic appeal. Installed horizontally or vertically, these cast metal knobs and pulls add a dash of masculine solidity to any decor. Spruce up the cabinets with knobs or pulls in gunmetal, oil rubbed bronze, or satin nickel finishes. Amerock’s award-winning decorative and functional hardware solutions have built the company’s reputation for chic design accessories that inspire homeowners to express their personal styles. Available in a variety of finishes and styles, Amerock offers high quality designs at affordable prices. Founded in 1929, Amerock is headquartered in Mooresville, NC. For additional information please visit www.amerock.com, Facebook, Pinterest, Twitter, Houzz and Instagram.